With their beautiful horizontal branching, corduroy-like leaves, pendulous yellow flowers, haunting aroma, and changeable leaves it’s hard not to lust after them. In addition to all that they are also winter blooming plants which really seals the deal. I’m a sucker for winter blooming plants. Bringing a plant into your garden that starts blooming in January means that you can effectively extend the busiest time of the garden by three months or more. It also provides you with some joy that you desperately need when you’re out working in the garden in December, January, and February, and let’s be honest. 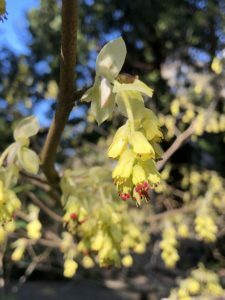 Around here you’re not going to be sipping drinks on the patio in December and January so the only real way to enjoy the witch hazels, Sarcococca, and Daphne is to get yourself outside in the garden. Sure it might be cold but that’s what long johns and gloves are for. One of the most charming aspects of these winter-blooming plants is that they seem to turn the seasons on their head. For a winter-blooming plant, the autumn of the calendar is their spring. When the rest of your garden is shutting down and the leaves are turning color as they detach, look closely at your winter blooming plants. Huddled under an umbrella in the cold rain and grey skies, you’ll see those same tiny green buds that get you so excited in the early spring. Winter is a busy time in the garden if you’re doing it right. I find that winter blooming plants like the Corylopsis tribe are essential to your happiness while you’re out there changing things around. In the winter my plants are on wheels. Plants under my care start their lives (after adopting them from the Kruckeberg Botanic Garden of course) in hypertufa pots on a northerly wall of my house right next to the kitchen door. Here I can admire them for a year or so and ponder where to plant them. Once I have a feel for some places that might work I start auditioning them by moving the pots around our property. I put them here or there changing my mind every time a new consideration strikes me, for weeks or months until it feels right. Once it seems like they might have a home, I nestle the pot in the ground and push a bunch of mulch up around the outside and leave them for another few months to a year. Eventually, I usually take the plunge and finally dig them in only to change my mind again as soon as it’s watered in. By then I usually just decide to wait until the end of the summer. Fall usually finds me waiting eagerly for that last leaf to drop so that I can get started moving them. I’m constantly moving everything. Most of this is because I have no idea what I’m doing, but part of it is because of something Dr. Kruckeberg said somewhere about a “judicious” placement of plants being key to a successful garden. It’s hard to be judicious when you don’t know anything, so…my plants are on wheels. Eventually, I’ll be able to say that I took “a very judicious approach to the placements of my plants” as I snap my suspenders and adjust my pipe. Until then…well, you know. Vroom Vroom. Like so many of my favorite plants, I had never heard of Corylopsis, until encountering my first example at the Kruckeberg Botanic Garden. As it turns out, there are a number of species to admire that the garden staff has spent years trying to key out and identify. Turning a home garden into a botanic garden means that a lot of the plants weren’t properly identified or accessioned in the way they would have been if it had been a botanic garden from the start. Given Art’s vast knowledge as a professor and Maureen’s exacting skills as a propagator, one can’t exactly look back in the Monrovia catalog and match the pictures to identify them either. Many of these plants came as seeds from travels abroad or at home or through personal connections at the university. In general, there are at least 5 species of Corylopsis at the garden and as you would expect they are a survey of some of the best. There are some that form small a tree and some that are either wide or vase like shrubs. 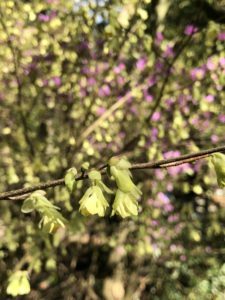 They all come into bloom at different times from January through March, they are wonderful understory plants that perform well in the garden and all of them perform well in light shade, humus-rich soil that’s moist but well drained. Some are more vase-shaped while others have a more distinctly horizontal habit but they all have the same languid shape that reminds one of Witch Hazels. They aren’t in a hurry to grow tall and large, they seem more concerned with expressing a beautiful curve or lazily snaking to a shaft of light. Heidi says that they are easyish and great for pruning if you want to try your hand at it. Mixing them with dark evergreens or against tall conifers is a good idea as the bare stems blooming are a beautiful shot of color when it’s sorely needed. There is chinensis which is robust, well known and bigger than pauciflora. Sinensis is native to central and western China and was also planted in October of 1975. Veitchiana is a cultivated form of sinensis with tighter flower clusters and named after the famous nursery that introduced these plants into the trade. Corylopsis spicata has the tendency of a shrub and has more stout twigs than the others. It has a very pronounced zig zaggy habit which I imagine Mareen found charming and which is probably also the reason that it has been pruned so severely. Vicki told me once that Mareen loved to prune things to encourage the branches to zig zag. She must not have been able to keep her hands off of this one. C. spicata was also a very popular plant in the Edo era of Japan. By far the best of the Japanese eras. Then there is C. pauciflora or Buttercup winter hazel. Probably the nicest example of the species horticulturally speaking. It’s compact and delicate habit combined with its slow growth make it a very well behaved and beautiful winter blooming shrub. Around the start of February, the naked branches are festooned with 2-3 inch racemes that dangle like glowing lanterns in the winter dark. The paucity of flowers implied in the name is only in relation to other members of its tribe. “Slightly less floriferous” must not have sounded as good in Latin, so we are stuck with pauciflora, but it’s mean and undeserved. As if the delicate tracery of the branches, the winter-blooming, the fragrance, and its gentle nature were not enough the leaves are also show stoppers. They look like a pointier, corduroyed version of katsura leaves. They emerge after the flowers as bright bronzy orange and gradually turn to a vivid bright green, holding on to a reddish-violet color on the edges. The fact that the leaves come after the flowers and change from red to green just reinforces the idea that these plants seem to exist in some upside down world. The venerable old example of a pauciflora at the Kruckeberg garden was planted in 1968 and was actually a gift that they had originally given to some friends. These same friends gave it back to them when they moved to the east coast. Plants on wheels indeed. Note to my friends. If you ever move please give me back all the plants I have given you over the years. For other beautiful examples of pauciflora go to the Center for Urban Horticulture at the UW. They have a 70-year-old plant that is still under 4 feet tall (did I mention compact habit and good manners?) and espaliered against a trellis. It’s a beauty. Go pay your respects. When you’re done paying homage stop by the garden and pick up a few examples to take home to your own garden. You won’t be disappointed.